by the Hon. Sir George Bellew, C.V.O. Garter King of Arms. Coat of Arms no 6 April 1951. The fleur de lys of heraldry, with its three ” petals,” its cross-bar, or knop, or ring, and its triple ” stalk,” is probably of no greater antiquity than heraldry itself. Examples of it in that particular form, examples which are mostly very indistinct or doubtful, which occur in pre-mediaeval art, are so rare as to suggest that they are accidental and have no established place in ancient symbolism or decoration. It is true that certain decorative patterns used in the art of several, perhaps even many, of the ancient civilizations, contain floral forms which are strongly reminiscent of a fleur de lys. But these never seem to be ” complete ” : they usually form only part of larger patterns or consist only of the ” head,” and look very much like some kind of lily, conventionally depicted, which indeed is probably what they arc intended to be, or is their source of inspiration. There is not very much to be said about the fleur de lys as a symbol. In Christian sacred art it has, since it is called a lily flower, been identified with the Virgin Mary, and since it is a tri-parted figure, with the Holy Trinity. In heraldry, and in a more mystic age, when men liked to see a hidden meaning in almost everything, the three ” petals” have been held to denote such things as three desirable knightly qualities. The fleur de lys is really an ornament, and not a symbol. In heraldry it is also a cognisance and it is possible that originally it was not intended to be anything else. The question of its origin has nevertheless received much attention, and has been the subject of a great deal of conjecture and speculation. Some see in it a direct descendant in an unbroken line, so to speak, of the lily patterns of the ancient world : others derive it directly from the iris, or the flag, or some other flower or lily : others again prefer to see in it a spear-head, or a bee, or even a frog (both of which last have been ancient French emblems in their time). Another view, and perhaps not the least probable, is that it is derived from the sort of flower-shaped ornament of varying detail which, so far as is known, served no purpose other than that of decoration and which ensigned the sceptres of many of the ancient Frankish, English and other kings of the 1st millennium after Christ (and perhaps formerly), as may be seen from their surviving coins. This fleuret is usually of a fleur de lys pattern, having the three “petals” and sometimes, the knop. If it were removed from its sceptre and furnished with a decorative base of the right kind it would become a fleur de lys. If this is in fact what happened then the heraldic fleur de lys owes its existence simply to chance and to a good sense of design, coupled no doubt, with a need for a distinctive cognisance in days when that need was being felt all over Europe, due to the invention of European heraldry. In support of this it is perhaps worth mentioning that in 13th century heraldry the fleur de lys sometimes went by the name of floret, an obsolete variation of fleuret, a flower-shaped ornament. So far as is known, it so happened that a Frenchman, in the person of King Louis VII., was the first to use a fleur de lys as a cognisance. It appears on his seal, of about the middle of the 12th century. Thereafter golden fleurs de lys on a blue field became the Royal Arms of France, and the fleur de lys itself became identified with the French Royal House, and indeed with France itself. 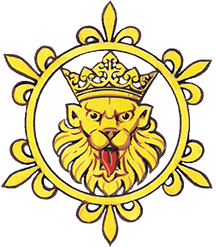 Nevertheless, it was not, especially in the first few centuries of the heraldic era, an exclusively French and royal emblem, since it is to be found in the heraldry of many unrelated families all over Europe during that period. It was probably at that time considered to be no more than a distinctive, decorative, and pleasing heraldic pattern, which indeed it is. 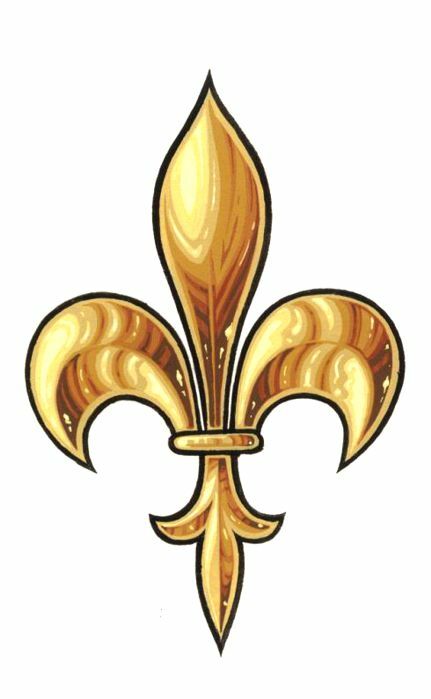 But in France the legend grew up that the fleur de lys was really ” fleur de Louis” and that it had been a gift from heaven to Clovis, first Christian King of the Franks who was baptised in the year 496, and whose name was but the Frankish form of Louis. On the left, 13th century: on the right, late 15th: and in the centre a modern design. Although there is no very definite pattern for any particular period there are characteristics which usually enable the experienced heraldist to date a fleur de lys fairly accurately.